Unless you have an out-worldly memory, you forget small things on a daily basis. There are techniques one can use to improve focus and memory. Writing things down and using to-do lists can help too. 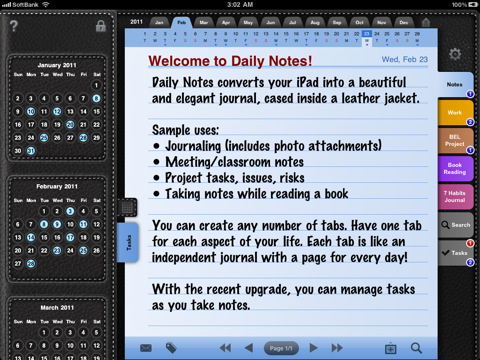 Daily Notes + ToDo app for iPad gives you the ability to do both. It is a great tool for meetings, brainstorming sessions, research, and anything in between. 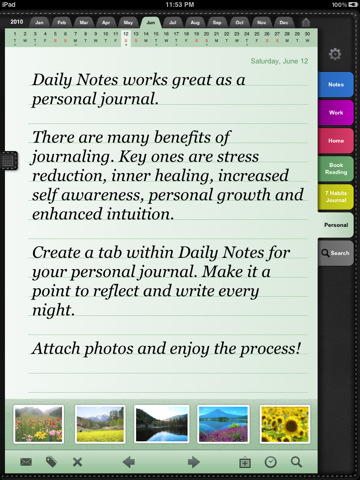 Daily Notes + ToDo looks like an e-notebook on steroids. It lets you organize your notes in tabs. By using tabs, you can keep your personal, business, and entertainment notes separate. Need more tabs? More can be added easily. Each tab will include every day in the calendar. Themes, font, and other aspects of your pages can be changed. Users can take notes and use tags to look them up. The task manager feature is a nice touch. Notes can sent to Dropbox for backup. Worried about security? You can password protect your notes in this app. Overall, Daily Notes + ToDo is a very helpful tool for students, professionals, and anyone who is into taking notes / managing to-do lists. It looks sleek and does what it promises.